They extend along the north and east coasts of the island. 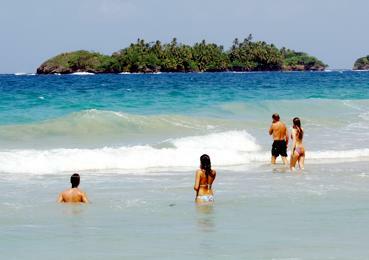 They are, except for Bluff Beach at Colon Island, the best of the Panamanian Caribbean, all with white sand from neighboring coral formations. In the opposite side of Bastimentos Town, we found First, Wizard and Dreffe beaches, the last also known as Red Frog Beach. They can be accessed directly from town walking along a path that crosses the hills. Red Frog Beach, can be reached also by a couple of private paths (you pay for), one of them part of the Red Frog project. 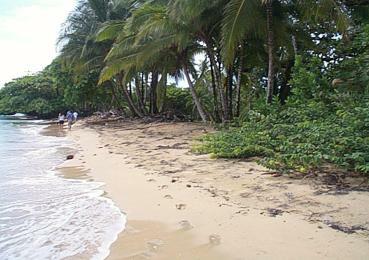 Continuing eastward, we find a very small beach called Polo, that is accessible only by boat with a good connoisseur of the place. Once inside the Marine Park, we find Long Beach, the largest of the island and nesting site for sea turtles, especially the Leatherback (Dermochelys coriacea) and the Hawksbill (Eretmochelys imbricata). The northern beaches of the island have something in common, they face the open sea and are somewhat dangerous due to the existence of strong currents perpendicular to the coast, so it is recommended not to venture far out to sea to avoid accidents. At Old Point and the east side of the island, including the Zapatillas Cays (also within the Marine Park), we found several small beaches, most unnamed, very quiet and safe because they are protected by coral reefs that absorb the impact of waves and currents. To reach them the only way is by boat.